When last we left Storybrooke, Ingrid the ice queen absorbed her Spell of Shattered sight to save everyone, and Elsa and Anna have sworn to bring her memory back to Arendelle… as soon as they get back. 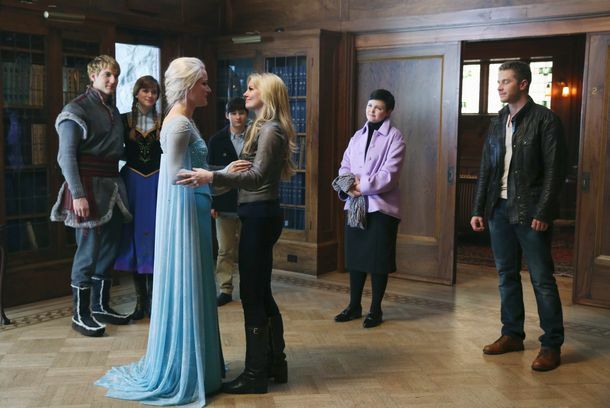 Their first attempt to leave Storybrooke brings them to the town line, where Elsa melts the ice wall. However, they can’t safely cross over just yet; Ingrid’s magic remains as a perfectly vague plot device that will prevent anyone from ever returning to Storybrooke once they’re outside of it. It would seem that they need a more substantial mode of transportation, like a portal or magic beans (it cracks me up how casually Emma talks about such things now). Elsa doesn’t seem to mind the delay, until Anna and Kristoff break the news… Hans and his brothers took over Arendelle. Having heard the plan, Rumpelstiltskin summons Hook for a report and squeezes the information out of him (almost literally; he’s holding Hook’s heart pretty tight). Seriously, though, does no one find it strange how much time those two are spending together? Has no one thought, “gee, those two people that hate each other are always whispering and glowering together in the corner… perhaps someone should investigate,” at all? Rumpelstiltskin tells Hook that he wants Anna out of town as soon as possible; she not only knows Belle, but she also knows about his plan to cleave himself from the dagger… tonight, in fact. The stars have finally aligned. Rumpelstiltskin will be free to take on the world, and Hook will die at his hand. We then cut to a flashback of what I’ll simply call the ‘Beauty and the Beast’ era, back when Belle was (a pretty well-treated) prisoner to the glittery-giggler version of Rumpelstiltskin. THERE’S A GRECIAN URN AND A HERCULEAN HELMET ON THE SHELF! WE’RE GOING TO SEE HERCULES IN THE FUTURE!? 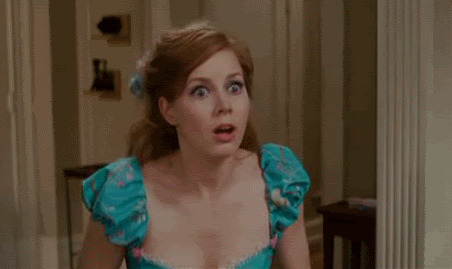 WE’RE GOING TO SEE CAMELOT IN THE FUTURE!? — with a magic gauntlet. Despite his whole I’m-Evil-Don’t-Flirt-With-Me persona, Belle still does trade witty banter with him until even I’m starting to remember why they have such great chemistry (despite the still-unsettling age difference). Oh, and the gauntlet can locate a person’s greatest weakness (like loved ones that can be held for ransom). Back to the present: Rumpelstiltskin invites Belle on a real honeymoon to “a magical city called New York,” and she starts to pack. And yet Marian comes to Regina at Granny’s, both to thank her and to inform her that she’s going to bow out. She can see that Robin has fallen out of love with her, and she’s not going to force him to stay out of obligation. Despite the guilt lacing the situation, seeing as how Robin had to make peace with his wife’s death twice over… it feels a strange arrangement, but not wholly impossible. So.. REGINA GETS TO BE WITH ROBIN AFTER ALL? Hook and Rumpelstiltskin follow a walking broom to the Sorcerer’s house, looking for a portal to get the Frozens (what I’m now calling Elsa and Anna and Kristoff) out of town as soon as possible. As they prepare to search for one, the broom magicks the Arendelle portal out of nowhere (because apparently magic brooms can do that). While Belle’s packing (rather comedically) for her trip with Rumpelstiltskin, Henry drops in to ask her how Rumpelstiltskin got his happy ending in the book. Belle assures him that now that Regina’s starting to make better choices, she’s on a better path and will get a happy ending eventually. In his search to help her find a bigger suitcase, Henry knocks down a few things… including the Camelot gauntlet of weakness-finding. Belle seems uneasy at the sight of it. Flashback! Rumpelstiltskin sends Belle to do laundry. Instead, she finds a dalmatian puppy and follows it into the ominous woods! (Granted… I’d probably do the same thing. I was always the kid rescuing stray animals in our house.) But she didn't heed the ominous music playing in the background, so she practically deserves it when a dark figure kidnaps her! Hook finds Emma and the Frozens at Granny’s: he tells her that he found the portal, for real. But unbeknownst to all the good guys, Hook is not working of his own volition; Rumpelstiltskin is forcing every word out of him by using the enchantment on his heart! Now that it’s clear how unable Hook is to communicate his enslavement to others, it’s much more tragic and heartbreaking. The best he can do is grip Emma’s wrist extra-hard and give her a sorry look. She finds that sort of strange, but then just ignores it because he's just probably being his weird self and everything is okay. 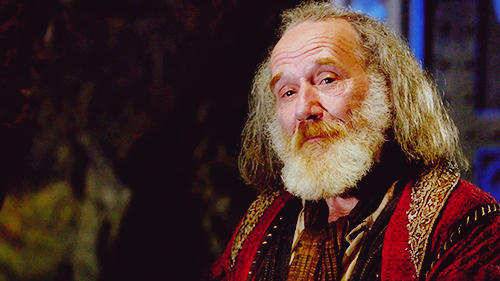 We return to another flashback, where Rumpelstiltskin looks for his laundry maid and finds her gone. Instead, a circling crow drops a sand dollar... which turns out to be a jedi-holograph-transmitter! 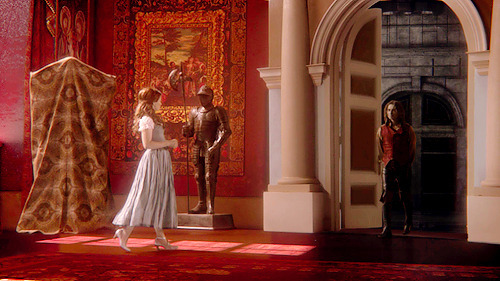 He finds that Belle is being ransomed for the gauntlet. Since no one’s around to notice his emotions, Rumpelstiltskin actually displays some concern. But SUDDENLY, Marian collapses! What is this frostbite? The ice spell is returning to her body, thanks to a remnant of magic inside of her called a CONVENIENT PLOT DEVICE! But by now, her heart is likely already infected (though she’s not covered in ice like other fully-infected people have been in the past). It seems the only way to save her is to send her over the town line. But it’s a one-way trip, and they can’t send her alone... so Robin and Roland must join her. Regina, you’re so selfless! Why must the authors keep giving you such a hard time!? Blast you, authors! As goodbyes are made at the town line, Rumpelstiltskin meets Regina to bid his own farewell; he admits that he’s leaving, too. He wants her to say goodbye to Henry for him, and that even his snooping around the shop will be missed. Regina confesses that Henry was helping her look for the Author, to find her own happy ending. Rumpelstiltskin confesses that he doesn’t know who the Author is, but he got his own happy ending because he took it. The more he talks, the more like the old Rumpelstiltskin he sounds. He even holds her hand and admits that he wishes she could get a happy ending, too; all she needs is for Marian to be dead. Could he convince her to be evil again? Surely not!.. but she does seem to think about it for a long, pained second. Fortunately, she snaps out of it. I actually teared up at this! My gosh! These writers are good, blast them all. As the Robins stroll away, Regina eyes the paper illustrating her potential happy ending with Robin… and then tears it up. Don’t give up, Regina! Flashback: Rumpelstiltskin brings the gauntlet to the coast. Maleficent appears in response to his ransom call, and he starts to choke her… but she’s not alone! Ursula appears in a glossy artificial-fabric dress (have I mentioned how I feel about the modernized, impractical costumes on this show?) and then… Cruella DeVille arrives, too!? Since when did she start controlling dalmatian puppies to lure unsuspecting peasants into traps!? (Even if Maleficent just created a fake dog with magic, it's a stretch of thinking I don't want to have to do right now.) And since when is she from fairy land instead of modern(ish) England!? Rumpelstiltskin finds himself stuck, holding the gauntlet and choking Maleficent, but therefore unable to save Belle as Ursula’s squeezing her to death. Finally he gives up the gauntlet and the three “queens of darkness” leave. Belle’s touched. Rumpelstiltskin grumbles that he still doesn’t care about her. ...to await the stars’ alignment, and the roof opens. Out in the sorcerer’s house, the Charmings and the Frozens find the portal door. Emma and Elsa share a lovely sisterly hug, then Elsa and Kristoff walk through the door. Right before she leaves, Anna asks everyone to send her thanks to Mr. Gold, because he sounds perfectly lovely. Who is he? This worries Anna; she wonders why Gold would help her leave town, unless he were trying to cover something up. Knowing Gold to indeed be the scheming type, the Charmings realize they need to get back to town soon and find out how he’s been playing them! Belle, ticked as all get-out, stands behind Rumpelstiltskin and holds his magical dagger in her hand! Three cheers for the lady! She then commands him to drop the heart, release everyone, then transport himself with her to the town line for their first little domestic. Once on the border, she finally gives him the tongue-lashing he deserves. She tells him about how she found the real gauntlet, which means that he never really risked it or gave up any form of power for her. From there, all she had to do was connect the dots of suspicion that she’d previously ignored. Then she used the gauntlet to find his weakness, and it led her to the real dagger. That means that she wasn’t his greatest love; his power was. She’s spitting fire now that she knows he never really changed, and if I didn’t know better I’d expect her to ninja-kick him across the town line. She doesn’t kick him, of course, but she does use his greatest love — his position as the all-powerful Dark One — against him in the form of the dagger. In fact, she uses it to order… him… to leave town forever. Rumpelstiltskin begs Belle because he doesn’t want to lose her… but she snaps that he already has! He backs over the line and his limp comes back and he collapses, powerless and exiled and separated from Belle forever, and JUSTICE IS RESTORED by BY GOLLY THE FEELS! Back in Arendelle, the Frozens have re-conquered their kingdom (and Anna apparently got to punch Hans again, several times). Elsa looks so much like her animated self that I keep doing double-takes, and Anna’s in her wedding dress, and they’ve found a portrait of Ingrid to hang in the palace, and it seems that their portion of the story is currently the only “happily ever after” we’re gonna get for a while. Back in Storybrooke, Emma replaces Hook’s heart and their relationship is restored... despite the uneasy feelings that I get whenever I recall that Hook once eloped with the mother of the guy who had a baby with Emma. Because you really did forget, didn't you? Still, it’s still nice to see him fully good-guy again, and no-longer enslaved. Later, Emma meets Regina at Granny’s for shots (and to tell her that she did the right thing. “Of course I did; that’s why I’m miserable,” Regina replies, in an all-too-true sentiment). But Henry charges in to tell them that he found something in the sorcerer’s house! It’s a secret passage to a library, with empty fairytale books identical to the one that holds their past stories! It would seem that Operation Mongoose is on a roll, and Emma even joins the party. Six weeks later in ‘magical’ New York City, Gold limps onto Madison Avenue. 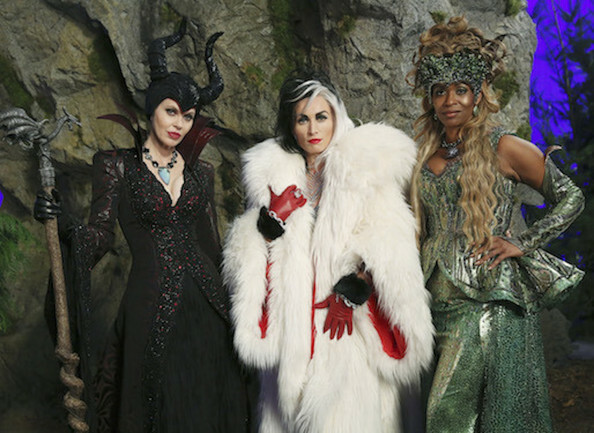 Flashback: Rumpelstiltskin meets all three “Queens of Darkness” on the coast again. It seems they wanted the gauntlet to help win themselves happy endings. However, he takes it from them (or else shows them the real one, which means he faked them out… but somehow I doubt they’d have been stupid enough to be fooled, so he probably did give up and then retrieve the real gauntlet). He tells them he needs no help winning a happy ending of his own, though they insist that the villains can never win by themselves. Back in NYC, Rumpelstiltskin reaches an aquarium to talk with the fish-feeder… who happens to be Ursula. He admits that he has now found that Villains really never get their happy endings, so they’re going to find this Author and change his plans for the Story… after they pick up the other two ladies. Tune in next year for… the three ‘Queens of Darkness’ coming to Storybrooke, nearly all of the characters becoming self-aware of their own roles in a larger Story, and the Heroes' happy ending being disrupted yet again. Big. Surprise. There. ** Take a minute to realize just how ridiculous that last question sounds. Surely at some point when Elsa was trapped in the evil urn of magic-suppression or when she was brought to our world, her powers went out of Arendelle, which meant that the enchantment maintaining Olaf’s life force was destroyed. 1. Of course, it’s possible that he could be re-created once they return[ed]. But can his memories be re-created? Not that we’re ever going to find out since it seems the adventures of Frozen are over… though I was so hoping for a little more Hans action. That guy could have had some great shenanigans and an impressive redemption arc if we had the time… And we really need more non-magical villains in the mix. I’m getting sick of witches and sorcerers and the like. The only shady mortal in town now is Will Scarlett, and he’s just a drunk thief. 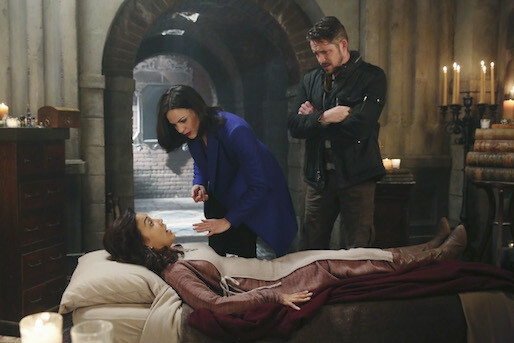 C. Since it seems that Storybrooke is expanding beyond its borders a bit (since Ursula and the others will be coming in from the outside), we may not have seen the end of Robin Hood and his family! I hope so; that may have been a fitting goodbye to those three, but it still was not a satisfying ending for Regina. Do they expect her to fall in love with yet another newcomer? D. So if Rumpelstiltskin has visited Camelot, does that mean that we’ll get to see that place at some point in the future? 1. Perhaps they’ll be using the “Sword in the Stone” version of all the characters, with a very odd old Merlin and young king Arthur (with flashback to his peasant days, of course). "Hey, I didn't choose my voice double for that movie, okay!?" E. This one is really out there, but still fun to think about. Since Ursula is “the” sea witch, is it possible that she could be paralleled with Calypso from Pirates of the Caribbean? Not exaaactly a fairy tale, but imagine the cameos! We could get Davy Jones back! F. Hercules is coming. You saw the jars and the helmet on Rumpelstiltskin’s shelves; you know it’s gonna happen! (Maybe if we’re lucky, the show will redeem Disney’s poorly-rendered plot of Greek mythology… though they may maintain the various characters for continuity’s sake). OOOH, who gets to play Hades!? HIM I want to see! Can’t you just imagine all the quips as he battles Emma and all the rest!? 1. I bet Hades will kill someone and the Heroes will have to rescue him/her from the underworld. 2. Or… Hades and the whole Hercules storyline will be introduced when the heroes try to retrieve a lost loved one from the underworld. 2.5. It’ll probably be Henry.